When given the option to go out of state and volunteer to work on a service project I jumped at the chance as soon as I could. I didn’t give it a second thought. 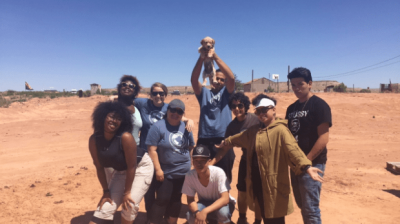 I knew what I signed up for and for that I’m glad.. My experience in the Navajo Nation will be a trip that I will never forget. I had such an amazing and interesting time there and after meeting everyone, I wasn’t ready to leave. I also wasn’t prepared for the small emotional rollercoaster I experienced during the last couple of days. Let’s be honest, during the first couple of days we really had our work cut out for us, but it was worth it. We built part of a fence, which was not easy, and took a lot of teamwork, patience, hard work and friendly banter. I learned to appreciate someone else’s hard work, detail and culture. Now-a-days it is so easy to go on the internet and research a certain social justice topic and learn about ways you can help, but being able to actually contribute and get hands on experiences makes you want to apply the things you learned to your everyday living. On the trip I met wonderful and strong people with many aspirations who make you want to better yourself. We also got to work with some of the people there and work on other things like cutting wood for some of the homes that needed firewood for cooking and keeping their houses warm.